Derry have got off to a winning start in Division Four. Any notions that promotion is a formality for Derry were dispelled amid a thrilling, opening day Division Four victory for the Oak Leafers against Antrim in Corrigan Park on Sunday. Padraig Cassidy's injury time fisted point eventually settled an absorbing affair which Lenny Harbinson's Saffrons will feel hard done by not to have taken anything from. 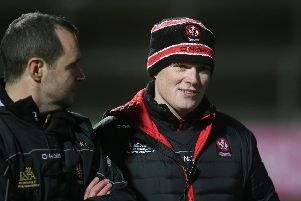 Damian McErlain has been at pains to pint out to anyone who would listen that this league will be a dogfight of a division and his words could not have more accurately described the bitterly cold, wind swept Sunday against opposition who were treating the fixture with Championship intensity. The game could have hinged on any one of six or seven pivotal moments. Even after Cassidy edged Derry in front it took a breathtaking Michael McEvoy block on Owen McKeown's shot to ensure the two points would be heading back over the Glenshane. When Karl McKaigue fouled Ryan Murray, it gave the Lamh Dhearg forward the chance to grab Antrim's sole score of the first half from the resultant free but the could have had a goal seconds later. Conor McAtamney grabbed Derry's fourth point before Lynn added a fifth but the game lacked any real fluidity with runners constantly being blocked or pulled back. Antrim came out fired up and point from Paddy McBride and Colum Duffin brought Derry's advantage back to 0-6 to 0-3 and gave the home support something to cheer. That's enthusiasm looked to be doused when Michael McCarry upended Enda lynn as he went through on goal. The Antrim defender somehow escaped a trip to the sin bi but Shane McGuigan extracted the necessary punishment by firing the penalty high into the Saffron net. At 1-06 to 0-3, Derry possibly thought they had weathered the storm. They hadn't. Derry responded well through a Patrick Coney point but when McBride's free was added to by a huge Stephen Beatty score, the game was in the melting pot at 1-07 to 1-05. Mark Sweeney produced a superb block to ensure McGuigan didn't get a second goal as Lynn pushed the Oak Leaf advantage out to three points with a lovely free against the wind. Again Antrim rallied with Murray (free) and a lovely McBride point before McFaul's attacking mark left it 1-09 to 1-07 with minutes to play. Coney won another penalty but this time Lynn's spot kick was superbly saved by Padraig Nugent. That fired the home crowd even more but just when Derry needed settling, Cassidy got himself on the end of a flowing move to fist the point that secured the win. There was still time for McEvoy to produced his superb block. Derry had done enough. Just. 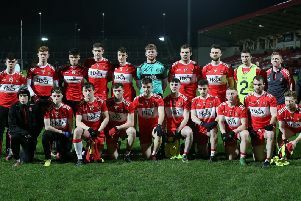 Derry scorers: Shane McGuigan (1-0, 1pen), Christopher Bradley (0-3, 3f), Conor McAtamney (0-1), Ciaran McFaul (0-1, 1m), Enda Lynn (0-2, 1f), Emmett Bradley (0-1), Patrick Coney (0-1), Padraig Cassidy (0-1).